Figure 1 shows the image unlabeled. In Figure 2 we have overlaid the EVA route upon this image so as to show where the crew set foot. While the crew were supposed to visit Cone crater they stopped 20 meters short of doing so due to some confusion as to their exact location. That said, they did visit some large rocks located adjacent to Cone crater’s rim. The enlargement of this Lunar Orbiter image clearly shows some large rocks poised near the crater’s rim. 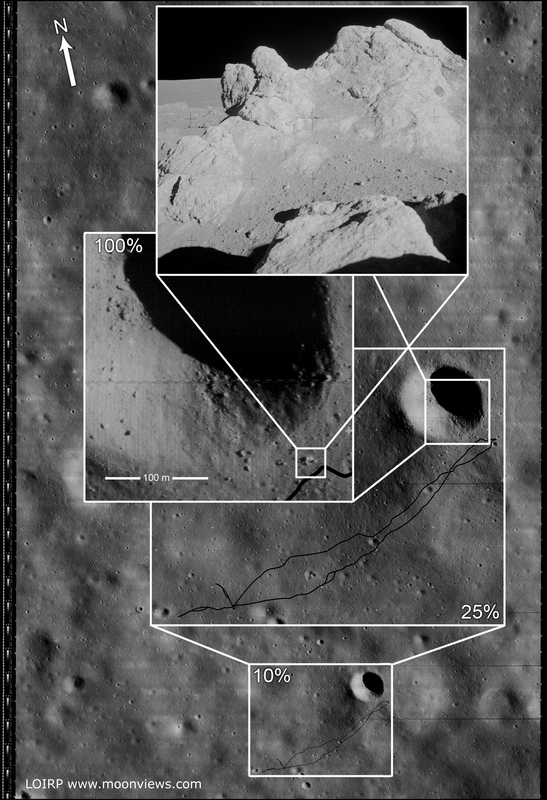 The inset photo shows the largest outcropping as photographed by the crew on the surface. NOTE: We originally posted these files in an incorrect orientation. This was due to how the images originally show up when they are retrieved from the original tapes. Thanks to all of you eagle-eyed viewers we caught that. We have replaced those earlier files with ones that are correctly oriented to North, South, East, and West. This image has been recovered in its original high resolution format from original Lunar Orbiter project data tapes using restored tape drive hardware and will eventually be submitted to the PDS (Planetary Data System). The full resolution is online here at NLSI. 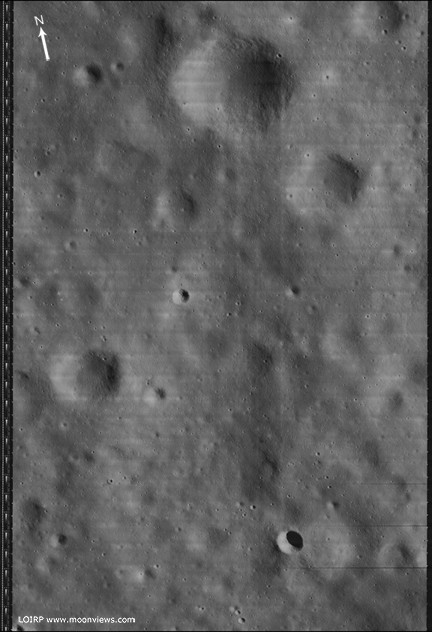 LOIRP Note: We will be putting the full resolution version of this image on the NASA Lunar Science Institute website with the layers preserved for Photoshop for all you folks to have fun with! We only ask that you send us copies of what you do and credit us if you publish it anywhere. Very cool. Thanks for putting these up! Another fantastic image – as they all are! But users beware, it’s presented here in mirror-image form, east and west reversed. If Shepherd and Mitchell had this detail, it’s fairly certain they would have found Cone Crater with less difficulty. Amazing, once again, what you guys have been able to pull out of the noise. It seems from the surface closeup of the boulders that Shepard and Mitchell may have been gazing at the far rim of Cone Crater. I remember thrilling to this mission, but for the Cone EVA, there was no TV as the camera was on a stationary tripod near the LM; it was not intended to go on the big traverse. The astros were quite exhausted during the EVA with very high heart rates, up to 160/min. The estimable Phil Stooke is indeed correct – I was wracking my brains earlier trying to work out what was wrong with this picture… …the orientation of the photos taken on EVA 2 just didn’t gell with the new image. Nonetheless, an astounding effort! We will correct the orientation of the image and re-post tomorrow. In Lovell’s book “Lost Moon” (later the basis for the movie “Apollo 13”) he said that Nixon promised the crews of Apollo 11 and Apollo 12 NOT TO WORRY – if they had to abort the mission they would fly the next one. Nixon did not make the same promise to the crew of Apollo 13 so Shepherd and the other two rookies flew Apollo 14. I wonder who would have done the better science? Eh? These photos are becoming an important asset to the many people who want us return to the Moon to stay. I really believe that if these had been available in 1971- Shepard and Mitchell would have known where they were and could have easily pushed on to the edge of Cone crater- because Mission Control would have had no apprehensions about ‘losing’ the crew that might have been out of visual range of the LM. They could have told them exactly where they were- without guess work. Dennis- Thank You and your team. You have earned your stripes! Stoked about what youse guys are doing here! I was in college (science major) at the time and missed out on a lot of what NASA was doing pre-Apollo. (And there was no way to share such stuff at the time anyways.) So this is like getting to see the whole thing unfold for the first time! I hope those lucky-stiff student volunteers appreciate what they’re getting to do!